A late header by Ryan Giggs gave United a deserved point in this thoroughly entertaining Champions League match. The home crowd were ecstatic when Scott McDonald's delightful lob from 14 yards gave Celtic a 13th-minute lead. United pinned Celtic back for much of the first half, but stout defending limited the Red Devils to half chances. Giggs headed an 84th-minute equaliser when Artur Boruc could only parry a Cristiano Ronaldo shot, then Dimitar Berbatov missed a great late chance. The result leaves United requiring a point for certain qualification, while for Celtic, with Villarreal six points ahead, they must win their last two matches and hope the Spaniards fail to take a further point. When United took to the field on a crisp Glasgow evening wearing their all-blue strip, you suspected former Rangers striker Sir Alex Ferguson was enjoying a joke. With a noticeable difference in quality between the squads, Celtic were hoping that the noise and passion created by their fans could unsettle the visitors and embolden their own starting 11, which was minus the talents of the injured Aiden McGeady. Having played McDonald as a lone striker at Old Trafford, Celtic manager Gordon Strachan gave 19-year-old Cillian Sheridan his Champions League debut, believing the Irishman's physical presence could test Rio Ferdinand and Nemanja Vidic. 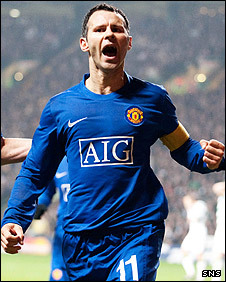 The match started at a frantic pace, with Giggs, partnering Carlos Tevez up front, looking in the mood to inflict damage on Celtic's European hopes. A brutal challenge by Barry Robson on his international team-mate Darren Fletcher allowed Ronaldo to have a crack at goal, though his free-kick sailed a few yards over Boruc's bar. Celtic caught their breath and began to venture forward with runs by Maloney. If the opening exchanges were characterised by passing and shooting that lacked precision, the opening goal was an example of perfect finishing. A speculative header found Gary Caldwell at the edge of the United box and his cushioned header set up McDonald, in the inside left position, who remained composed to lob Ben Foster, in only his second start, from 14 yards. It was Celtic's first goal in the Champions League this season and the first conceded by the cup holders. United responded by increasing the pace of their play. Michael Carrick, Tevez, Fletcher and Ronaldo had Strachan's men pinned back. Ferdinand volleyed an awkward ball over from three yards, a Vidic header was cleared off the line by Celtic captain Stephen McManus and the same player went close from one of many United corners. Former Villa striker Maloney offered the home defence occasional relief. On the half-hour mark he cut inside from the left wing and rifled a dipping shot directly at Foster, who gathered well. United looked most menacing when they played the ball quickly through midfield. 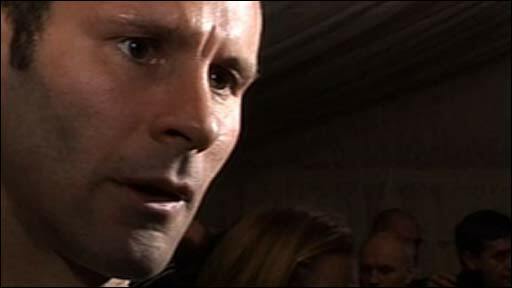 In one such spurt, Giggs seized on an error by Paul Hartley, ran at the Celtic rearguard and ought to have tested Boruc. Instead he slid the ball wide of Nani and the chance to equalise was gone. For all the Red Devils' superior technique and movement, in open play Celtic were able to frustrate the visitors on their raids. On numerous occasions, Caldwell and McManus and a retreating midfield got in the way of United's efforts at goal. Strachan will have been satisfied at the workrate and intelligence of his players. Scott Brown, Barry Robson and Paul Hartley hounded Carrick and Fletcher incessantly and for the greater part, held on to the ball when they could. Ferguson's half-time talk encouraged United to up their game at the re-start, but not before Maloney curled a long-range shot in at Foster. In a raucous atmosphere, the Celtic fans cheered their team on as they stymied successive waves of United attacks. Caldwell cleared a dangerous low cross by Tevez, then a low left-footed shot by Ronaldo found the grateful gloves of Celtic's Polish keeper Boruc. Substitute Berbatov came close when his flick-on from five yards was cleared off the line by Maloney. Rooney came on for Tevez for the last 20 minutes and his first involvement in the game was a long-range shot which Boruc turned round the post. With just six minutes remaining, United levelled the match. Boruc was unable to hold a thunderous swerving shot by Ronaldo from 25 yards and in rushed the veteran Giggs to head home as Boruc lay helpless. United could have snatched a victory in the final seconds when the ball was played into Berbatov. His shot on the turn whipped past Boruc's right-hand post and Celtic's slim chances of reaching the knockout stages remained intact. Celtic: Boruc, Hinkel, Caldwell, McManus, Wilson, Hartley, Scott Brown, Robson, Maloney (O'Dea 75), McDonald (Hutchinson 81), Sheridan (Donati 63). Subs Not Used: Mark Brown, Naylor, Nakamura, Caddis. Manchester Utd: Foster, Rafael Da Silva (Evra 66), Ferdinand, Vidic, O'Shea, Ronaldo, Fletcher, Carrick, Nani (Berbatov 46), Tevez (Rooney 71), Giggs. Subs Not Used: Kuszczak, Anderson, Park, Evans.